Some months ago I reviewed Volume 2 of Mompou’s complete songs and I was so enthused by what I heard that I ordered Volume 1 as well. The songs on this disc span a period of almost sixty years, from the first setting of Maeterlinck’s Quand l’amant sortit (1914) to the five Valéry songs (1973). When he wrote the first he had just turned twenty; when he completed the last he was eighty. And it seems that Mompou’s styles were fully developed from the very beginning. I use the plural since you can listen to two songs that were composed almost simultaneously and they are very different from each other, while songs composed thirty years apart can be very much alike. Maybe this chimes well with Mompou’s own statement: "Í have absolute faith in the forms of expression I carry within me. I cannot subordinate my spontaneity to theories." He also stated in 1974: "I always strive to achieve something very simplified, a true synthesis. Composers are usually happy to keep adding more and more pages to a score. I, on the other hand, enjoy cutting things out, eliminate anything I feel superfluous, until I’m left with the essential. Then I’m happy." The five songs that constitute Combat del somni (Dream battle) were written over a period of almost a decade, and the first of the songs Damunt de tu només les flors (Above you only flowers) illustrates this statement. The song has a melody that goes directly to the heart, simple and beautiful and with a straightforward accompaniment. The interludes are more elaborate with some surprising harmonic twists. You notice the fingerprints in the other four as well; they are from the same hand, but each of them has personal touches. The four songs from 1925 (trs. 9-12), settings of his own poems, also reflect his ideals and they never cease to fascinate. This group is preceded on the disc by Mira quina resplendor (See what splendour), a Christmas carol for children’s chorus, written in 1966. He also made a version for solo voice and piano, which was unpublished until now. I am very happy that it has become available for the world to savour, since it is a song that will probably haunt me forever. It happens that when I come across music that was unknown for me, I replay it at once to confirm that my initial positive reaction was fair, and often I leave it at that. But this song I couldn’t resist playing four or five times and even the last time it spoke to me with the same freshness as the first time. That’s a good sign. The early La cançó de l’ávia (Grandma’s song) (1915) to an anonymous text also has that hard-to-define quality-it communicates. That is the secret behind all kinds of art and then it is up to the consumer to tune in on the same wavelength. Mompou’s piano music spoke to me quite early and when I at long last found his songs we had already a relationship. Let me just mention two further favourites, both rather wayward. Psalm from 1936 is based on Psalm 130 and is one of very few sacred works by Mompou. It was not even intended to be published. The other one is Cantar del alma (Song of the soul) from 1943, which is based on a poem by St John of the Cross (1542-1591). This mystic many years later inspired Mompou to what is probably his masterpiece Música callada (Silent music) (review). Cantar del alma is sung as a recitative a cappella with the piano only playing interludes-a kind of antiphon. 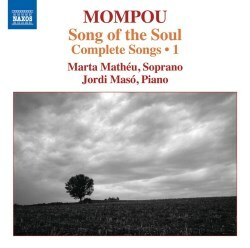 As on volume 2 Marta Mathéu is an ideal ‘mouthpiece’ for Mompou’s rather low-key messages. She is simple and straightforward, never making heavy weather of the music, only acting as an intermediary. Jordi Masó, who among other things has recorded the complete piano music of Frederic Mompou (review), is the ideal accompanist. He also provides the excellent liner notes. It’s only a shame that the sung texts with translations couldn’t be enclosed, but follow this link and you will get access to Lynell Joy Kruckeberg’s Frederic Mompou: A Style Analysis of thirty-five songs with English translations. Mompou is still little known, but his music is well worth getting acquainted with. One volume of his complete piano music should be a good introduction but lovers of vocal music might prefer to go straight to his songs. This disc and its companion will provide inspiring listening sessions for years to come. Many of the texts can be found, however, in Lynell Joy Kruckeberg’s Frederic Mompou: A Style Analysis of thirty-five songs with English translations.